Mosquito Fleet was the name given to a busy group of small steamer ships that provided basic transportation back and forth and up and down Puget Sound before the advent of the Washington State Ferry System or the development of good inter-city roads. The boats were relatively small and usually family-owned. Competition was fierce so you had to provide reliable service to keep your customers. They buzzed around the Sound like mosquitoes at a picnic. I dream of those days whenever I find myself stuck in a traffic jam on I-5. How great to be on the water cruising to my destination instead of being stuck in yet another endless backup. Mosquito Fleet Winery, which opened its doors a couple of months ago in Belfair, Washington, draws its inspiration from those little boats. I’d like to say that the owners, Jacquie and Brian Petersen and Jacy and Scott Griffin, saw a parallel between the wine business today and the fleet’s business back them. Their winery is family-owned, too, and starting out small in a very competitive industry where finding and keep customers isn’t easy. But in fact they drew the name from a different source — an an almost forgotten part of Washington State wine history. 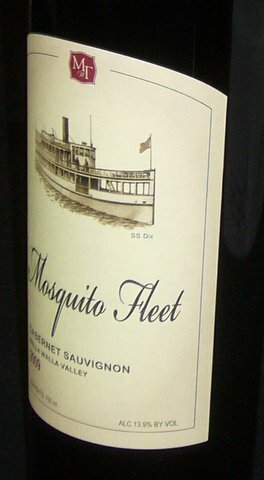 Mosquito Fleet is located just a few miles from the old St. Charles Winery, which was Washington’s first bonded winery, started just before Prohibition’s end by Charles Somers. Somers wasn’t a wine lover — real estate was his business. He sold many parcels on Stretch Island, promising the buyers good income from table grape and juice sales if they planted vines on their properties. They did and I guess that’s why the nearest little town is called Grapeview. Then the Depression came and those markets disappeared. With the end of Prohibition approaching, Somers saw an opportunity to use those surplus grapes to make wine. The first wines were sold legally in drug stores, exploiting the “medicinal wine” loophole in the Volstead Act according to Ronald Irvine’s great 1997 book The Wine Project: Washington State’s Winemaking History. Then Prohibition ended and the winery business took off. A Concord grape hybrid named Island Belle (a.k.a. Campbell’s Early) was the go-to variety on Stretch Island (ripening vitis vinifera on Puget Sound is a challenge, although a few have been successful). Hoodsport Winery still makes an Island Belle that has a loyal local following. 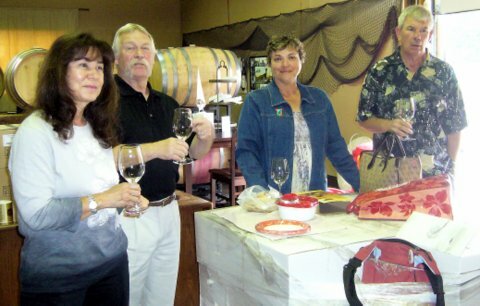 The Somers family kept the winery going until 1987 when they retired from the business. The historic facility was converted to a museum devoted to Puget Sound maritime history, with special focus on the Mosquito Fleet. So in choosing the name of their winery, the Petersens and Griffins sought to honor more than the little ships that carried people and their wine in the early days, but also the St. Charles Winery that helped launch the modern history of Washington wine. Sue and I stopped in to visit Mosquito Fleet during its hectic opening weekend and winemaker Brian Petersen (photo right) invited us to return for a more thorough tour. We were joined by volunteer research assistants (and experienced wine tourists) Sarah, Bob, Lydia and Mike (see photo below). Petersen and team started small — a few hundred cases to begin with — but are scaling up rapidly to the 2000-3000 case level. It’s mainly a production facility now, but a tasting room is planned for the future. The initial response to Mosquito Fleet has been very positive, Peterson said, with strong sales so far at the winery and through Puget Sound region restaurants, wine shops and even a few upscale supermarkets. Wine is a relationship business and those who have tasted the wines (or met the Petersens and Griffins) have spread the word. The current 2009 release includes a Pepper Bridge Vineyard Cabernet Sauvignon and a Meritage blend. (Our friend Bob was especially taken by a barrel sample of the 2010 blend and would have hauled it home with him if he could have muscled the heavy barrel into his car.) The crowded barrel room promises more choices in the future, including a Port-style wine made with the authentic Portuguese grape varieties. The Petersens and Griffins seem to want to both honor wine history and make some, too. The winery’s name, the website and the labels (each of which features a particular Mosquito Fleet ship) look back, but the wine inside the bottle is very much focused on the future. Petersen’s medical background shows in his attention to detail and relentless desire to learn more about winemaking. The grapes go through an insanely rigorous triple sort before fermentation and then ageing in new French and American oak. I was particularly impressed by the balance of the wines we sampled from bottle and barrel and the effective use of oak. Petersen is justifiably proud of what he and his team have accomplished so far, but it’s clear he believes they can do even better as they continue to experiment and learn. Learning and teaching are two sides of the same coin and what struck my research assistants was Petersen’s strong desire to share all that he had learned with them. They found their visit to Mosquito Fleet unusually stimulating and informative. The history behind the Mosquito Fleet label seems to be an authentic indicator of what this project is about, not just a clever branding exercise. It will be interesting to follow Mosquito Fleet to see how they convert the past and present into a prosperous future and how they navigate in the competitive wine market environment. Thanks to Brian Petersen for his hospitality. Thanks to my loyal research assistants for their insights.